Winter has been seemingly non-existent over the last year or so, but mostly due to the lack of snow. The cold is still there though and boy did I feel it today! Commuting in the winter sounds a lot more extreme than it seems. With the right clothing and layering techniques you can ride through event negative temps. I’ve become extremely dedicated to checking the weather either the night before or the morning of a commute. Smartphones now all come with some type of weather app that gives you a good idea of what to prepare for. I consider winter commuting to pretty much be anything 50 degrees or cooler. 50 is a warm for these parts, but for some folks that’s what their winter is. What I wear at 40-50 degrees is long unlined running tights, a technical long-sleeve shirt, technical fabric bike jersey over the long shirt, mtb shoes, a cycling cap, and a helmet. Depending on if it’s a windy day I may bring a wool hat, gloves, and a hi-vis vest with me. 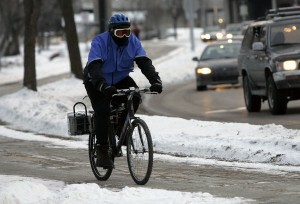 A good rule of thumb is to start your commute cold as you will warm up once you get going. I’ve made the mistake several times of layering up and being warm from the start. That usually ends up in a hot, sweaty mess or having to stop and take time to peel layers off. 30-40 degrees I will wear something similar, but with fleece lined tights, a wool jersey, definitely a hi-vis vest, gloves, wool beanie, sunglasses, wool socks, commuter spd shoes, and I’ll bring a light jacket like the Patagonia R1 with me if I find I get too chilly. The R1 is nice because it adds a layer, but is breathable so you don’t over heat. The next level is a little tricky. Today is was 28 degrees and I decided to go with thermal or fleece lined tights, a technical long sleeved shirt, wool jersey, Shower’s Pass Portland jacket (basically a soft shell with lots of reflective bits), gloves, a wool beanie, wool socks, commuter spd shoes, sunglasses, and of course a helmet (I always wear one when I ride). I did pretty well with this, but my legs and toes got cold when I was nearing mile 4 of my 5 mile commute to work. I had wished I grabbed a balaclava, no not the delicious Greek dessert, but a partial face mask/hat combo you wear to protect your face while in windy conditions. Goggles may also become an addition on days that get any colder than 28. I’m guessing adding a balaclava, Seal Skin socks (a brand, not made out of actual seals), and a pair of woolie thermals under my tights would probably keep me warm at 15-28 degrees. Anything below or hovering at 15 I will probably have to pull out the big guns adding rain pants over the tights as a vapor barrier (look up how vapor barriers work, it’s pretty neat), wear my down jacket with a shell over it or pair a wool hooded sweatshirt to keep nice and toasty. I will sometimes use my wool Chrome Pasha hoodie that I’ve had for a few years to add a nice layer of toasty to the mix. Wool is expensive, yes, but as long as you treat it well it will last a LONG time. Benefits are that wool doesn’t harbor bacteria like tech fabrics do, so you don’t stink as much and the clothes will stay fairly fresh after a few uses. I used to wear beanies made from all sorts of fabric blends, but they’d always end up smelling like dirty hair even after I washed them. With wool beanies I never have that problem. I’ll freshen them up every so often with a wash, but it’s never a necessity out of smelliness. Becoming a bike commuter will turn you into a wool lover. Actually if you do any activity outdoors and start experimenting with adding wool to your collection, you’ll probably enjoy it. I have two wool undershirts, two wool beanies, loads of wool socks, and a wool hoodie. I plan to keep adding to my collection as I can afford it. Working in the industry has its benefits, but it’s still pricey even if you have access to purchase items at a discount. My next wool purchase will probably be a Buff (neck gaiter if you will) or some woolie tights or a long sleeved shirt. What can I say? I drink that kool-aid! For any of you who are curious I’d like to give a general overview of some of my favorite cool/cold weather commuting items by brand. I’m not getting paid by these folks. These are all items I’ve purchased on my own and have used for a few seasons so I know they are worth the money. They make an awesome gift. REI’s socks are warm, durable, comfy, and downright awesome. They are often on sale in store as they have bins and bins of them. I have two of these as I thought I lost mine one day when I was out visiting dealers. Turns out it was in my laundry pile and I now have two highly functional beanies. One is reversible and the two can be combined to make a super warm and comfy hat for extra chilly days. In all honesty I don’t know what series of gloves I have, but I like them and they keep my fingers pretty toasty on the bike. I don’t think there is a current version of what my gloves have feature wise. Mine have zips on the side and built in reflective material on the top of the glove. There’s fleece on the thumb and the side palm of the gloves so you have plenty of places to wipe your nose (kind of gross I know) or you glasses. I’ve had this jacket for a few years and I always end up forgetting that I have it when cold weather shows up. Then when I open my closet and discover it’s still around I get excited to wear it again. The jacket is basically a nice soft shell that repels rain, has nice reflective piping and other details on it that make for a great commuting jacket. Pit zips, adjustable sleeve openings and side openings are a nice touch. My only beef with the jacket is that I wish it were a half inch longer. When I layer under the jacket it can have the tendency to ride up a little. I can’t even start to describe how much I love this piece of clothing. The Pasha was a definite splurge that ended up being one of my best clothing decisions to date. The hoodie is made out of merino wool, has a nice length, has thumb holes, good side, and rear pockets. I wear this on and off the bike as it makes for the perfect match under my down jacket. I would definitely buy this hoodie again. I believe this is technically a men’s jacket, but I got a branded one from work that seems to fit me just right. It’s not great for super cold days, but for days in that 37-50 zone it works so well. It’s breathable, but warm enough to keep you going. My jacket is black so when I wear it I put a hi-vis vest over it. I’m not sure the exact model of vest I have, but I’m sure if you walk into any Trek dealer you’d be able to find one. I used a $50 gift card I had to purchase the vest. It’s super lightweight, packable, breathable, and has nice reflective points. There’s a few different companies who make similar products so I’m not here to push Bontrager more than anything else, but it’s the brand that I have. I love using running tights or workout tights for my commutes. They stretch like regular bike shorts/knickers would but cost a lot less and work well for my 5 mile (one way) commute. Currently I have a pair from Moving Comfort that aren’t lined and a pair from Target that I found and thought I would give a try. It’s nice to try an purchase all name brand stuff from shops, but when you need to take your wallet into consideration there are some good alternatives. I’ll probably look into purchasing an actual cycling full length tight with chamois in the next month or so and see how those work. They’re pretty expensive, so I’m not quite ready to take that plunge. Again, even working in the industry doesn’t always mean things are always cheap!